Easy Car Touch or EC Touch is a free app developed by Motus Lab out of Italy which is AppRadio compatible and available in the US App Store. The app brings together the most commonly used features and apps while driving to one easy-to-use interface. Here are a couple of videos showcasing the app and more details. I played around with EC Touch for a while this morning and I can confirm that it works nicely. There were a couple of issues I ran into which I've mentioned later on. EC Touch integrates the following apps: iPod, iPod Video, TuneIn Radio, Phone Controls, Google Maps, Web Browser and Facebook. All these can be accessed from the app's interface. The in-app shortcuts are customizable. Icons within each app are presented on a carousel. 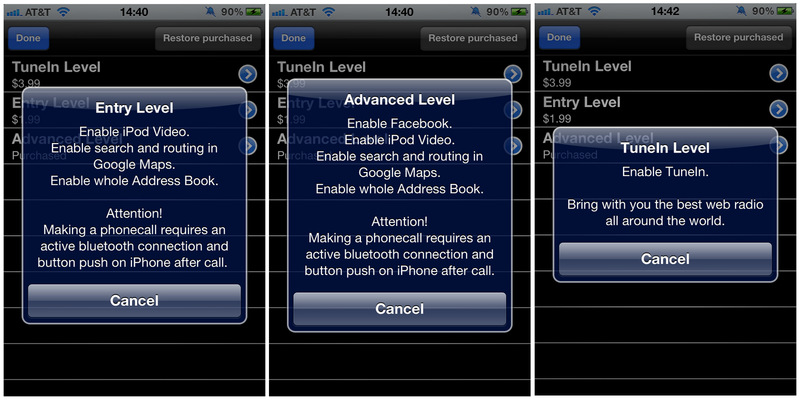 Many of the features require an in-app purchase from the EC Store which can be accessed within the app on the iPhone. The EC Store gives you three purchase options: 'TuneIn Level' ($3.99), 'Entry Level' ($1.99), and 'Advanced Level' ($2.99). Here are details of each. I purchased the Advanced Level. Apps: The iPod interface is different from the stock AppRadio interface. It works well, requires a lot of scrolling but it looks nice. I didn't have any issues playing videos either. The Web Browser is really easy to use and with my AppRadio 2 it seemed to work very smoothly. I didn't access any graphic heavy websites though. 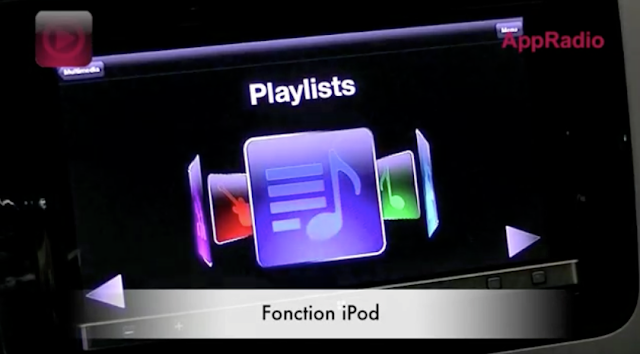 Scrolling was smooth and the texts and pictures looked crisp on the AppRadio 2's display. The keyboard is the stock AppRadio 2 on-screen keyboard. The address book from your phone can be accessed from EC Touch. Contacts are again arranged in a carousel format. If you have thumbnails added to your contacts you can see those as well. Google Maps work very well too. Zooming and panning is smooth and the purchase of the Advanced Level unlocks the search and routing features. The Facebook interface is quite different from the iPhone. It runs against a black background but is usable. I don't use Facebook very seldom if at all so I don't care much about this feature. I don't intend using TuneIn Radio for my music needs so I didn't purchase that. Issues: There were a couple of issues I had with the app running on AppRadio. Firstly, when you choose to make a call it exits the app and also requires you to end call from the iPhone itself. If you want to get back to the EC Touch app you have to relaunch it from your iPhone. I, however, didn't try making a call while connected over bluetooth to the AppRadio. Secondly, when trying to launch the iPod app the first time the application quit on me giving me the following error message. I had to disconnect the iPhone and reconnect it for the thing to work again. The issue hasn't occurred again though. Conclusion: I think EC Touch is a great alternative to the stock AppRadio app from Pioneer. Everything just seems to work the way it was intended to. Of course it is different from the AppRadio app in that you can't launch other third-party apps from here but it is pretty much all you need for a short trip. The logo on the home screen can be changed to one of the few car manufacturer logos (BMW, Lamborghini, Ferrari, Audi etc). Now only if I owned a Ferrari, the app interface would fit right in. American and Asian car brand logos aren't available. The Advanced Level purchase of $2.99 is worth it in my opinion for the features it unlocks. I plan on using this app for a few days to get to know it better. You can download EC Touch from the App Store today. The app is currently available for iOS users only. The icon is now there in the AppRadio launcher app! I like it for the most part. What I don't understand is why when using TuneIn it doesn't give the song information even though in most cases it is there in the list before clicking on the station. Also, why isn't the time displayed? When using any app on the app radio, only iPod and Pandora have the time. Why not StreamS, Livio, etc.? Would it be that difficult to add that feature? Anyone have an answer? After I posted yesterday, I noticed some bugs. The TuneIn froze a couple of times. It also played different stations but didn't advance to the screen for the station (stayed on the list screen). But as you said, it has potential. Could be a bit faster??!! Oh and the looks, it's ugly. why not in main app page to have directly this ??? I had an issue yesterday where I wasn't receiving phone calls that were coming in while I was running the EC Touch app. Have you or any of your users had a similar issue?